Feasibility of robot-assisted pyelolithotomy and concomitant pyeloplasty was evaluated (18). After docking the robot, the ipsilateral colon is reflected off the kidney and uretero pelvic junction is dissected free all around. 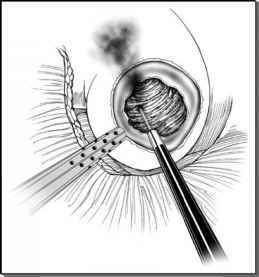 An appropriate pyelotomy is created for stone extraction and subsequent fashioning of the flaps for reconstruction. The pyelotomy is started by opening the entire length of the anterior wall of the pelvis, using the endoscissors, 3 cm away from the parenchymal edge of the renal sinus. The interior of the renal pelvis was explored to easily view the stone and remove it with the aid of long tip forceps. The removed stones are kept in a safe place in the abdominal cavity. At the end of the procedure, the stones are placed within the endocatch bag and removed through one of the port sites. The uretero pelvic junction is transected and the ureter spatulated laterally. The apex of the spatulated ureter is anastomosed to the most dependant part of the renal pelvis with interrupted intracorporeal suturing using 4-0 Vicryl suture 10 cm in length. Then the anterior half of the ureteropelvic anastomosis is performed using a running suture. The posterior wall is repaired using another 4-0 Vicryl suture 10 cm in length in the same manner. Lastly, the remaining part of the trimmed renal pelvis is closed by continuous suture. Some authors have also evaluated the feasibility of robotic extended pyelolithotomy for treatment of renal calculi as an effective treatment alternative to percutaneous nephrolithotomy.